An artistic creation is an event to be experienced, as well as a design to be explained. Created by Donna Marihart and Ann Opgenorth, out of the Ivy Ridge Studio in Bellevue, Iowa, this design suggests several themes found in the Bible. 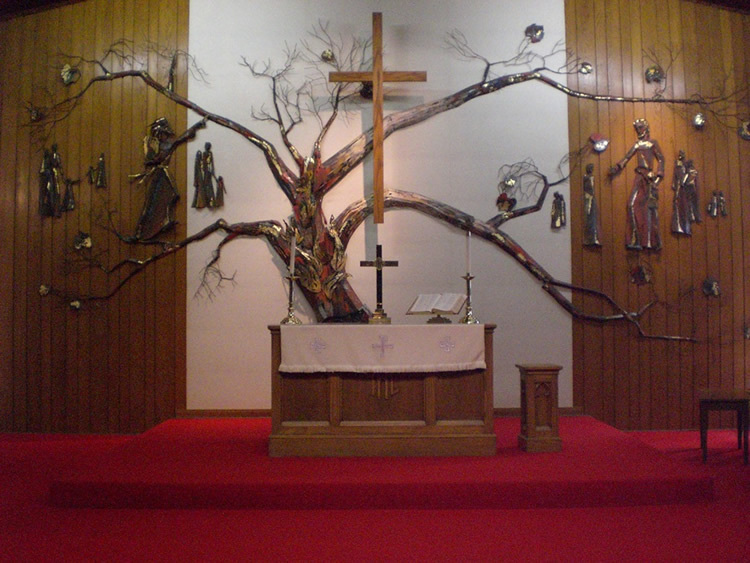 The tree standing in the center, and filling the entire wall combines several themes in both the Old and new Testaments. "I am the Real Vine, and my Father is the gardener. Every barren branch of mine he cuts away; and every fruiting branch he cleans, to make it more fruitful still. You have already been cleansed by the word that I spoke to you. Dwell in me, as I in you. No branch can bear fruit by itself, but only if it remains united with the vine; no more can you bear fruit, unless you remain united with me." "I am the vine, and you the branches. He who dwells in me, as I dwell in him, bears much fruit; for apart from me you can do nothing." Moses noticed that, although the bush was on fire, it was not being burnt up; so he said to himself, "I must go across to see this wonderful sight. Why does not the bush burn away?" When the Lord saw that Moses had turned aside to look, he called to him out of the bush, "Moses, Moses." And Moses answered, "Yes, I am here." God said, "Come nearer; take off your sandals; the place where you are standing is holy ground." The figure of Moses reveals the power and spirit of the Old Testament in the Ten Commandments recorded in Exodus 20. When all the people saw how it thundered and the lightning flashed, when they heard the trumpet sound and saw the mountain smoking, they trembled and stood at a distance. "Speak to us yourself," they said to Moses, "and we will listen but if God speaks to us we shall die." Moses answered, "Do not be afraid. God has come only to test you, so that the fear of him may remain with you and keep you from sin." The Sermon on the Mount balances the New Testament with the Old. The gist of all of Jesus teaching as found in Matthew 5, 6, and 7. Christ is shown surrounded by children as recorded in Mark 10:14-16. "Let the children come to me; do not try to stop them; for the kingdom of God belongs to such as these. I Tell you, whoever does not accept the kingdom of God like a child will never enter it." And he put his arms around them, laid his hands upon them, and blessed them. The flames seen on the tree suggest both the Burning Bush that Moses saw, and the tongues as of fire recorded in Acts 2:1-4. While the day of Pentecost was running its course they were all together in one place, when suddenly there came from the sky a noise like that of a strong wind, which filled the whole house where they were sitting. And there appeared to the tongues like flames of fire, dispersed among them and resting on each one. And they were all filled with the Holy Spirit and began to talk in other tongues, as the Spirit gave them power of utterance.